Stocks edged higher, with the S&P 500 extending its longest rally since 2017 to eight days, as investors awaited signs of progress in the trade war with China ahead of the latest corporate earnings season. Treasuries dropped, while West Texas crude hit a five-month high. The S&P 500 eked out a gain in thin volumes, rising to about 1.3 percent from its all-time high. However, catalysts remained scant Monday after trade talks ended last week in Washington without any timetable for an agreement. Apple lifted the Nasdaq 100, while energy producers rose along with oil prices. General Electric tumbled after JPMorgan cut its rating on the stock and Boeing dropping amid the ongoing fallout surrounding the 737 Max airplane. 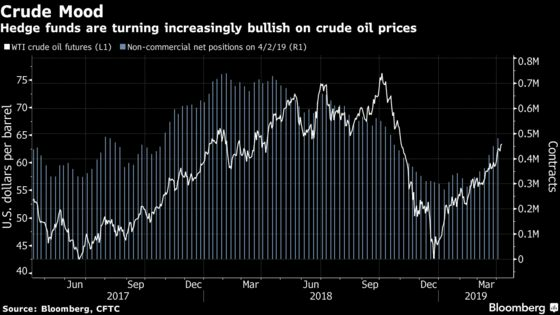 Crude extended its advance as an escalation of fighting in OPEC producer Libya overshadowed the biggest increase in U.S. active rigs since May. The dollar fell for the first time in three sessions. Following a stellar first quarter across many assets classes, investors are assessing prospects for further gains as the U.S-China seem unable to come to a final decision on trade and earnings season gets underway. Despite a lack of details emerging from last week’s discussions, Trump economic adviser Larry Kudlow said the two sides are closer to a deal, and that top-tier officials would be talking this week. A better U.S. jobs report Friday didn’t stop President Trump from suggesting the Fed should cut interest rates. Elsewhere, the pound edged higher as British Prime Minister Theresa May appealed to both the public and politicians in search of support for a compromise Brexit plan. In Turkey, President Recep Tayyip Erdogan cited “widespread irregularities” in local elections in Istanbul, sending the lira lower. The S&P 500 Index rose 0.1 percent as of 4:01 p.m. New York time. The Nasdaq 100 gained 0.3 percent, while the Down Jones Industrial Average fell 0.3 percent. The Stoxx Europe 600 Index decreased 0.2 percent. The MSCI Emerging Market Index rose 0.4 percent, hitting the highest in more than eight months. The MSCI Asia Pacific Index gained 0.2 percent to the highest in about six months. The euro increased 0.4 percent to $1.1261, the strongest in almost two weeks. The British pound climbed 0.2 percent to $1.3062. The Japanese yen gained 0.2 percent to 111.46 per dollar. The yield on 10-year Treasuries gained two basis points to 2.51 percent. Germany’s 10-year yield fell less than one basis point to 0.004 percent. Britain’s 10-year yield decreased one basis point to 1.107 percent. West Texas Intermediate crude rose 2 percent to $64.36 a barrel, the highest in five months. Gold advanced 0.5 percent to $1,301.90 an ounce, the highest in more than a week.